of Georgia Dance Unlimited, began dancing at the age of four and has extensive training in Ballet, Jazz, Tap, Hip Hop and Lyrical. She has performed in “The Nutcracker” with Rotaru School of Ballet and The 1996 Opening Ceremonies of the Centennial Olympic Games in Atlanta. Jennifer has been teaching in the Atlanta area for 19 years. In that time she has taught Ballet, Jazz, Tap, Lyrical, Acrobatics and Hip Hop to ages 2 to adult. Mindy Cox started dancing at the age of five. Soon after, her family moved and her dance studio was too far away. Her ballet teacher encouraged Mindy to keep dancing and gave her an “all about ballet” book. Every day she read and practiced from that book. After two years, she moved back to her hometown and was again able to attenddance classes. She danced with Kandi’s Dance Academy performing company for 5 years. She then danced for Cumberland College while continuing he professional lessons with the Lexington Tap and Jazz Company. She began teaching for Dance Centre in Williamsburg, Kentucky in 1998. It was then she realized she loved to teachdance as much as she loved to dance herself. Mindy is trained in ballet, jazz, lyrical, tap, and hip hop. She has studied with some of the world’s great dance teachers including Joe Tremaine, Darryl Retter, Jay T. Jenkins, and tap legend Al Gilbert. However, shenever forgot her first dance teacher; the one that taught her that if you love to dance, you should never give it up. She hopes to pass this philosophy along to her students. Mindy resides in Lawrenceville with her husband and two children. She loves to bake, play tennis, and garden. She also loves hanging out with her family and volunteering at church. Mindy is so excited about joining the GDU teaching staff this year and is looking forward to meeting your dancer. Valhalla Tyson began dancing at age 2 in her hometown of Lawrenceville GA. In 1989, at age 6, she enrolled at Dance Arts Centre; where she would attend classes for the next eight years. While at Dance Arts Centre, Valhalla took classes in ballet, pointe, jazz, lyrical, and tap. At 12 years of age, she decided to pursue her dream of being a ballerina. Thus, in 1996, Valhalla began studying at the Rotaru International School of Ballet, enrolling in the Pre-Professional Program. There she trained 5-7 days a week in ballet, pointe, character, pas de deux, and variations classes. Valhalla studied mainly with Pavel Rotaru, the founder and artistic director of the school, who was trained in the Vaganova Method of Ballet in his native Romania and at the world renowned Kirov Theatre. During his 27-year performing career, Mr. Rotaru was a principal dancer at the Romanian National Opera Ballet, the Croatian National Opera Ballet, Pacific Northwest Ballet, and the Atlanta Ballet. Valhalla was also fortunate to have the opportunity to study with Ramazon Bapov (former principal at the Bolshoi Ballet), Paraschiv Pieleanu (former principal at the Bucharest Opera Ballet), Kay Whiffen (former ballerina with San Antonio Ballet, National Ballet in Illinois, and Rotaru Ballet), and Irena Pasaric (National Principal Dancer with the Croatian National Ballet). In 2001, at age 17, Valhalla severely injured her knee while dancing. She spent the next five years dealing with surgeries, physical therapy, and more injuries. Even though being injured was devastating, it was during this time that Mr. Rotaru taught Valhalla how to teach the Vaganova Method of Ballet in order to make her a better dancer and to aid in her recovery. Valhalla taught at Rotaru International School of Ballet from 2003 to 2005. She was in charge of the Pre-Professional program for the Ballet/Pointe 1 and Ballet/Pointe 2 levels as well as teaching all of the Creative Movement, Pre-Ballet 1, Pre-Ballet 2, and beginner and intermediate adult ballet classes. In 2006, after her third and last knee surgery, Valhalla ended her pursuit of a ballet career to concentrate on teaching. She is looking forward to passing on her love and passion for ballet to future generations. Erica was born and raised in Lawrenceville, Georgia. Her passion for dance began at a very young age. After dancing around the house soon after she could walk, her parents finally decided to put her in Buford School of Ballet at the age of three. She then moved to a different studio at the age of 10 where she continued to dance and learn Ballet, Hip-hop, and Lyrical. Along with her studio classes Erica also took a Worship dance class that was offered at her school from 8th– 12th grade where she was able to perform in twice a year. Erica also took private voice and guitar lessons all throughout middle and high school years. This helped her understand the meaning behind the music. Erica is currently attending Gwinnett Technical College where she is majoring in Early Childhood Education. She hopes she will be able to teach her students the beauty of dance and have a passion for it just as much as she does. Kaila began dancing at the age of 3 and has never stopped. She is trained in tap, jazz, ballet, musical theatre, hip hop, voice and theatre. She was a member of the Susan Chambers Dance Company for 11 years. She has performed in the Macys Thanksgiving Day Parade in 2006, Royal Caribbean Stars at Sea in 2011, and many pre-professional dance performances. She is currently a cheerleader for the Atlanta Chiefs semi-pro football team, along with taking professional dance classes in Atlanta studios. She is presently a full time student at Georgia Gwinnett College. Prior to attending Georgia Gwinnett College, Kaila was a Repertory Dancer at Valdosta State University. She has studied under many well known dance artists locally and in New York City. Kaila’s future plans are to be in a professional dance company and continue sharing her love of dance to young children with teaching, along with being a choreographer and starting her own non-profit organization. Alie has had a passion for dance since she was just 3 years old.Growing up in Utah, she received extensive training in the areas of ballet, tap, jazz, and lyrical from the most reputable instructors in the state. She was a dancer in the 2002 Winter Olympics in Salt Lake City and was invited to perform in the opening festivities of the Indianapolis 500 Indycar race in 2003. She has performed across the country winning local and national competitions but has found the most joy in teaching and choreographing. Alie has over 10 years of dance teaching experience and has been successfully teaching students of all ages in Utah and Georgia. Alie and her husband moved to Georgia 6 years ago and have two little girls that share her love for dance. I have loved music and dance since before I can remember. ‎I have been dancing since I was ten and have experience in cheer leading, hip-hop, jazz, and ballet. I was accepted into a performing arts school playing the violin with the orchestra. While there i was on the drill team dancing at football and basketball games. I then began dancing with the performing arts dancers and took private dance lessons. After getting married and having two children I decided to set aside my pursuit of dancing professionally. 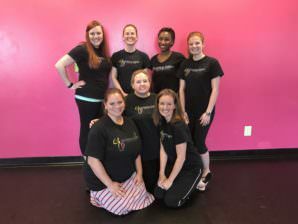 I am a self employed massage therapist, a stay at home mom and now following my dreams of spreading joy through dance by teaching dance at GDU.